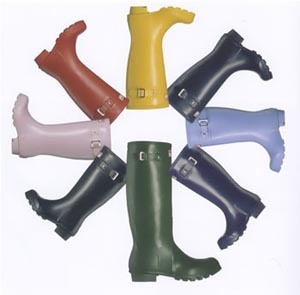 It may be the recent weather here on the East Coast that is subconsciously controlling this wishlist item, but I don't care, I just love Hunter Wellies. I love the industrial look of the rubber and I love that they come in a variety of solid colors, as opposed to printed wellies. While cute, I think a lot of prints come off as childish and I know I would be limited to wearing them on weekends only as opposed to throughout the week (or whenever rainy), like I could with a pair of discreet navy blue Hunter's. Hunter's retail for $115 and can be purchased at Nordstrom's, Bloomingdale's, Zappos.com, and even J. Crew. They tend to run large, so order a size down. Lucky for me, I wear a Women's 7 and can fit into the Kid's Classic version in a size 5/6 (UK4 and EU37). The Kid's size is actually narrower in the shaft of the boot which makes them not look as clunky around my skinny calves, and the best part is that they retail for $59.95 (almost a 50% savings from the adult version). Hopefully these will bring some sunshine to my rainy days in the future!